Us movie trailer: Get Out director Jordan Peele's new film looks terrifying. The trailer for Get Out director Jordan Peele's new movie Us is the stuff of nightmares. If you’re a horror movie fan, we’ve got a very exciting belated Christmas present for you. 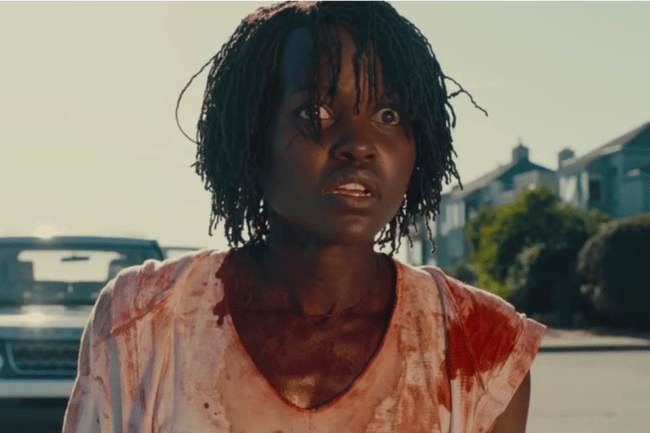 The trailer for Jordan Peele’s upcoming film Us is here and it’s utterly terrifying. Starring Black Panther stars Winston Duke and Lupita Nyong’o, the film follows a family as they head to their beach house to catch up with friends including A Handmaid’s Tale actress Elisabeth Moss. The family’s holiday soon takes a turn for the worst when they discover their holiday home is haunted by some creepy unwelcome visitors. The worst part? The terrifying figures look just like them. “It’s us,” the family’s young son says as an identical (albeit, horrifying) family descend on their driveway. Although Director Peele’s 2017 Oscar-winning film Get Out had a predominant focus on race, Peele said his decision to have a black family at the centre of Us was not “about” race. “[It was] very important for me to have a black family at the centre of a horror film,” he said. According to Vulture, Peele told journalists at a press conference last week that Us is about creating “a new horror mythology and a new monster”. “Stories about monsters are one of our best ways of getting at deeper truths and facing our fears as a society,” the director said. The upcoming movie is already gaining a huge amount of traction on Twitter, with many fans trying to decode the meaning behind the film. #USMovie looks so good ???? I’ve watched the trailer multiple times. I don’t like scary movies so I may be watching through my fingers ??????? ?‍♀️ but I gotta see it! I’m so gassed over this trailer for #UsMovie. I love horror films and this one looks super interesting. I love that they didn’t reveal too much. LOVE what they did with the music. Ugh, I’m going opening weekend. Us is set for release in Australian cinemas in March 2019.